Home-made mayonnaise is not difficult - you just need to be patient and add the oil very slowly, a drop at a time at first. Beating the egg yolk and the oil together makes an 'emulsion', where tiny droplets of the oil are suspended in the mixture. 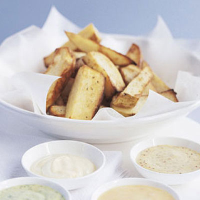 Mayonnaise is wonderful with these potato wedges and goes particularly well with seafood (especially prawns or crab). It will keep for 2 days in the fridge, if well covered. Place the egg yolk in a medium-sized mixing bowl and add the mustard and some seasoning. Using an electric whisk or balloon whisk, beat well, then add a drop of oil and whisk until incorporated. Continue adding the oil, drop by drop, until the mixture thickens. Once it has thickened, you can add the oil in a very fine, steady stream. Add the lemon juice and season to taste. Cover and refrigerate until needed. Preheat the oven to 220°C, gas mark 7. Wash the potatoes and dry well. Line a large baking sheet with baking parchment. Cut each potato into 8 wedges and place in a large mixing bowl. Add the oil, season and toss well to coat, then place in a single layer on the baking sheet. Bake for 50 minutes, turning the wedges over halfway through. Sprinkle with salt and serve piping hot with a good dollop of mayonnaise. If you add the oil too quickly, the mayonnaise may curdle. If this happens, place a fresh egg yolk in another mixing bowl and add the curdled mixture slowly, as you would the oil. When the mixture becomes smooth again, continue with the recipe. Why not try these flavoured versions: Pesto mayonnaise - Make the recipe above, then stir in 2 tablespoons fresh pesto. Sweet chilli mayonnaise - Simply add 2 tablespoons sweet chilli sauce and a few drops of Tabasco pepper sauce. Mustard mayonnaise - Replace the oil specified with half extra virgin olive oil and half vegetable or groundnut oil. Then stir in 1 tablespoon wholegrain, and 2 teaspoons Dijon mustard. Flavoured mayonnaise should be eaten on the day it's made. If you're short of time, use Waitrose Spicy Jacket Wedges, from the freezer cabinets.